I am aware that this book is non-fiction and therefore not within the normal scope of Scide Splitters. The author does, however, employ humor and I felt the book deserved attention. Besides, this is a bonus edition of Scide Splitters so nothing is lost. The regular edition will appear as scheduled with fiction to tickle the funny bone. Behavior, or more accurately, misbehavior at science fiction conventions has been a hot button issue in recent years. I am not suggesting that it wasn’t an issue before, it just wasn’t getting much attention. To the outsider, the intensity of the debate can be off-putting. Will you be safe at a convention? Will you inadvertently fall afoul of the expectations of those raising the issues? Enter Jessica Brawner’s Charisma +1: The Guide to Convention Etiquette for Gamers, Geeks, and the Socially Awkward, a lightly humorous and timely guide to good behavior and how to stay safe at cons. Charisma +1 covers a wide range of topics including hygiene, what to bring, personal space, no means no, personal safety, photography, lines, costumes, harassment, chivalry, panels, vendors, booth babes, art, flirting, promotion, selling, networking, fans, hotel staff, con staff and volunteers. If it sounds like it is aimed at nearly everyone going to a convention, that is because it is. While much of the advice in Charisma +1 will seem like common sense to the reader, keep in mind the oft stated phrase, “Common sense is not so common.” Also keep in mind that we all have our blind spots. Nearly all of us have experienced the uncomfortable awareness that we have committed a social faux pas, one that sends us looking for a rock to hide under. If you haven’t had this experience, then you probably need this book more than most, because you are likely oblivious to how your actions impact others. If you have had your share of looking for that rock to hide under, then this book will be a handy reminder of what you already know plus a few things you hadn’t thought about, all presented with a humorous coating that makes it easier to digest. Charisma +1 manages to succeed where much of the ongoing discussion does not, primarily because the author uses humor rather than browbeat the reader with a harshly presented list of dos and don’ts. I am not implying that the ongoing discussion does not need to take place, but there are many people, particularly men, who are intimidated by the ferocity of the debate. This can put them on the defensive and reduce the chance of the message coming across. Another thing Ms. Brawner does well is to not single out one subset of people – everyone can use good manners. Perhaps my biggest criticism of the book is the absence of a Table of Contents. Granted, this is a short enough book that flipping through to find what you want is not difficult, but a TOC would have been handy for quick reference. I also wasn’t too keen on the section on flirting, but then I’ve been married twenty-two years and my wife tells me I am completely blind when it comes to women flirting with me. At 96 pages, Charisma +1 is not a comprehensive guide covering all situations, nor does it claim to be, but what it does do is put readers at ease, helping them feel comfortable in their own actions and in how to react in unpleasant situations. 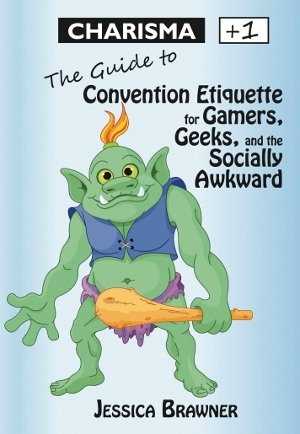 Jessica Brawner’s Charisma +1: The Guide to Convention Etiquette for Gamers, Geeks, and the Socially Awkward is available from WordFire Press. I would also like to point out that I got my copy of Charisma +1 at COSine 2015 (Colorado Springs’ SF con) and everyone seemed to be on their best behavior. My thanks to all the people who made my experience at COSine thoroughly enjoyable.